Born in Brighton, Sussex, in May 1965, he was taken to see many musicals from a fairly young age. His formal music training began with a few piano lessons when he was eleven years old but he very quickly realised that the organ was the instrument for him. He was fortunate to study both electronic and theatre organ techniques with the famous cinema organist, Bobby Pagan, who also taught him about orchestral arrangements and conducting. In 1980, playing the Wurlitzer organ at the Granada Cinema, Kingston Upon Thames, Michael won the Young Theatre Organist of the Year Competition, organised by the London and South of England Chapter of the American Theatre Organ Society. In 1984, he was honoured to receive the coveted Ian Sutherland Memorial Award from the Cinema Organ Society of Great Britain. In the spring of 1987, Michael joined Yamaha-Kemble Music to demonstrate the superb H series of Electone organs. He was so successful with them that, at the start of 1988, he became Area Manager for the South of England with responsibility for sales in the region, dealer and customer liaison and overseeing the ever-popular Yamaha Music Schools. Eighteen months later he decided to return to work as a freelance professional musician but he has retained links with Yamaha and, more often than not, will be seen playing their equipment. On the piano Michael has played for various events and functions at a great diversity of venues. These have included private residencies, the Butlins Holiday Centre at Bognor Regis and the prestigious Savoy Hotel in London’s West End. He has learned to play the drums and has had some voice training. Playing for dancing is another area where Michael is heavily involved, especially with his regular Tuesday afternoon Tea Dances and Saturday evening Ballroom Dances at Worthing’s Pavilion Theatre and Assembly hall. This work brings him into close contact with many top big bands including Ray McVay and his Orchestra, the Joe Loss Orchestra (now led by singer Todd Miller) and the great Ken Macintosh and his Orchestra. In the media, Michael can often be heard on the popular BBC Radio 2 programme, ‘The Organist Entertains’ and he has also been featured on television, both playing and demonstrating the magnificent Compton organ at The Pavilion Theatre in Bournemouth. Over the years he has made many contributions to and had regular columns in various magazines including Keyboard Player, Organ and Keyboard World and Organ & Keyboard Cavalcade. Michael is proud to be Principal Tutor for the Rye Wurlitzer Academy, training the next generation of theatre organists. 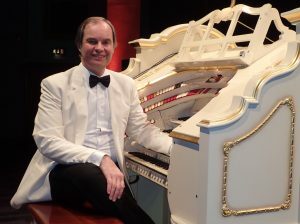 He is a Trustee of both the London and South of England Chapter of the American Theatre Organ Society, for whom he has a special interest in organising the annual UK Young Theatre Organist of the Year Competition, and of the Theatre Pipe Organ Preservation Society, operating both the Singing Hills and East Sussex National Wurlitzers.